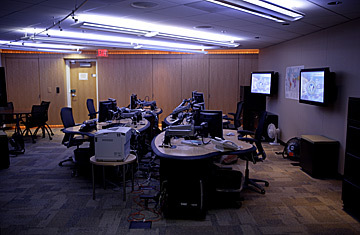 The National Counterterrorism Center (NCTC) in Virginia. the NCTC has elements of the FBI and CIA where terrorism-related information is shared on a real-time basis. Pity America's poor civil libertarians. In recent weeks, the papers have been full of stories about the warehousing of information on Americans by the National Security Agency, the interception of financial information by the CIA, the stripping of authority from a civilian intelligence oversight board by the White House, and the compilation of suspicious activity reports from banks by the Treasury Department. On Thursday, Justice Department Inspector General Glenn Fine released a report documenting continuing misuse of Patriot Act powers by the FBI. And to judge from the reaction in the country, nobody cares. A quick tally of the record of civil liberties erosion in the United States since 9/11 suggests that the majority of Americans are ready to trade diminished privacy, and protection from search and seizure, in exchange for the promise of increased protection of their physical security. Polling consistently supports that conclusion, and Congress has largely behaved accordingly, granting increased leeway to law enforcement and the intelligence community to spy and collect data on Americans. Even when the White House, the FBI or the intelligence agencies have acted outside of laws protecting those rights  such as the Foreign Intelligence Surveillance Act  the public has by and large shrugged and, through their elected representatives, suggested changing the laws to accommodate activities that may be in breach of them. Civil libertarians are in a state of despair. "People don't realize how damaging it is to a democratic society to allow the government to warehouse information about innocent Americans," says Mike German, national security counsel at the American Civil Liberties Union. Or do they? In all the examples of diminished civil liberties, there are few, if any, where the motivating factor was something other than law and order or national security. There are no scandalous examples of the White House using the Patriot Act powers for political purposes or of individual agents using them for personal gain. The Justice IG report released Thursday, for example, examined some 50,000 National Security Letters issued in 2006 to see whether the FBI misused that specialized kind of warrantless subpoena. The IG found some continuing abuse of the power, but blamed it for the most part on sloppiness and bad management, not nefarious intent. In a press release accompanying the report, Fine said, "The FBI and Department of Justice have shown a commitment to addressing these problems." There may, nonetheless, be reasons to feel wary of the civil liberties vs. security trade-off into which Americans have bought. If the misuse documented in the Justice IG report stems from incompetence, Americans may not be getting the security they bargain for in sacrificing their civil liberties. It's also possible the Justice IG may yet find among the abused Patriot Act powers examples of an FBI agent stalking his girlfriend or doing a favor for a political operative friend. Fine is still preparing a report on the illegal use of "exigent letters" in unauthorized demands for records from business. For now, however, civil libertarians will have to continue to argue that the danger lies not in how the government's expanded powers are being used now, but how they might be used in the future. "The government can collect information about the average citizen without any concern for their rights, but the citizen can't find out what the government is doing, and that's inimical to government of we the people," says the ACLU's German. So far, that argument hasn't convinced the people.